The deadline for college players to declare for the NFL Draft has come and gone. Does it affect these Early Bird Preview rankings? Of course. Some of the biggest losers (of players) were Louisiana State (7 players), Southern California (5 players) and Alabama (5 players). Luckily for these three schools they know how to recruit. While they all took a slight drop in ranking it wasn't by much. Then there were some teams that took huge hits at only one or two position. But when it's at a spot like quarterback, these losses can be devastating. Louisville, Texas A&M and UCF all lost big time quarterbacks, which directly caused them to drop in this preseason poll. Based on the Average Rankings Poll included in this update (takes into account other early preseason polls by averaging them out) Florida State is a unanimous team to start 2014 at the No. 1 spot right where they left off. Auburn and Alabama are easily 2nd and 3rd. If any one team made a huge jump it was Oklahoma after their impressive Sugar Bowl victory over heavy favorite Alabama. Not only did they win, Trevor Knight looked like the next big thing in Norman locking down a musical quarterback situation. UCLA is sure to be a Top 10 team since no one declared early for the NFL Draft. That includes top rated quarterback Brent Hundley. Their crushing win over Virginia Tech in the Sun Bowl was another shot in the proverbial preseason arm. Voters continue to dismiss UCF as a one-year American Conference product. Now that Blake Bortles will no longer be behind center their 2014 prognostication took a nose drop. But not here. Maybe a little but not by much since Coach O'Leary brings back 10 defensive starters. They will be the favorite to win the conference. Texas A&M will get better defensively. They will have to since Johnny Football and his top pass catcher Mike Evans moved on. Duke has slid into this version of the NationalChamps.net Top 25 update after a great losing effort versus Texas A&M in the Chick-fil-A Bowl. Coach Cutcliffe isn't going anywhere and his Blue Devils are worthy of this ranking just as they were deserving of a Top 25 ranking to end last season. For those out there hoping some new teams step up in the 2014 National Championship race to unseat the top dogs, don't hold your breath. 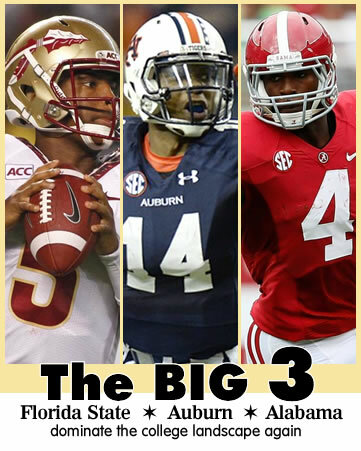 Florida State, Alabama and Auburn are clearly heads above everybody heading into next season. Granted it's expected that several non-senior players from these three schools will likely be leaving early to play on Sundays next fall. Regardless, perusing the depth charts and understanding what recruiting has done at these football factories clearly separates these monsters of the gridiron from the rest of the pack. The Florida State schedule gets a major upgrade with Oklahoma State, Notre Dame and Florida being offered as non-conference opponents. In ACC competition Louisville, Clemson and Miami dot the list. For Alabama and Auburn...it's really tough to separate these two in a ranking debate. NationalChamps.net gave a slight edge to Bama only because the Iron Bowl will be in Tuscaloosa next year. What the state of Alabama is accomplishing on the collegiate football field right now is nothing short of amazing. All three of these schools possess "The Most Wanted" head coaches by other programs and recruiting is on a roll. No question Florida State, Alabama and Auburn are the teams to beat next year. The Stanford and Oregon debate isn't ending anytime soon either. Stanford will continue to make a living off of the theory that offensive linemen win football games while the Ducks are flirting with one of the most prolific offenses in school history...and that's saying something. Oregon's wealth at the offensive skill positions is alarming. One of the biggest jumps this year is LSU into this Top 10 discussion even with the departure of their finally found passing quarterback Zach Mettenberger. The Bayou Bengals are rich with southern talent from top to bottom. They would have been in this spot last preseason if the NFL hadn't taken 11 of their underclassmen. Move over Miami, Florida, South Florida. Here comes UCF, the latest Sunshine State school to start pulling in some of that hefty state of Florida high school talent. Just last year about this time everyone had inked Louisville as the Top 10 surprise from the newly realigned/renamed American Athletic Conference. Not so fast...UCF rose up to win the conference. With NFL-worthy senior quarterback Blake Bortles UCF has all the makings of an undefeated BCS run next season, which would only mean they have to do better than the 11-1 record head coach George O'Leary posted in 2013. Texas A&M will have a better defense. Will they still have Johnny Manziel behind center? If they do, watch out for the Aggies. UCLA is another team right on the cusp of doing something really special with Brett Hundley at quarterback. A few teams like Missouri and Oklahoma State, regulars in this past season's Top 10 rankings, sure did lose a great deal of players. Head coaches Gary Pinkel and Mike Gundy, at each school respectively, know what it takes to win, they just have difficult work cut out for them replacing bodies. Pac 12 South Champion Arizona State falls into the same boat with only three defensive starters coming back. Promising quarterback Taylor Kelly will be asked to hold the rope. When looking for a surprise this year keep an eye on Minnesota. After an 8-4 regular season where running the ball was clearly the prime directive, this group has a sturdy offensive line coming back along with a ton of rushing weapons. The passing game seems to have improved a little in the later stages of 2013. If that part of the formula continues to develop Minnesota can make some noise. While not usually a big surprise, the Florida Gators are far better than a 4-7 record, being unranked and out of a bowl game. Injuries decimated this team. Don't count them out for next year if they stay healthy. This talent cupboard is far from empty. Finally, Ole Miss is back in the NationalChamps.net Dark Horse No. 25 seat again (like last year). Maybe our prediction was a little premature as 2014 looks like the year Ole Miss might finally start to see coach Hugh Freeze's recruiting dividends start to pay off in the win department. Ready for the playoffs? Here it comes finally after 145 years of college football where voters purely decided a two-team title championship game. Don't expect the messy debates to end anytime soon. In fact, the debate will only intensify until the powers-that-be determine that four teams isn't enough. Is NationalChamps.net too early? Not quite. The Early Bird Preview has predicted almost the same Top 10 the official AP Poll puts out eight months later in August. The selection process is not that difficult if you know what pollsters look for. We give you most of that information now. DO NOT MISS THE POINT: NationalChamps.net is proud to once again present the annual Early Bird College Football Breakdown (13th season). For those of you concerned with the rankings and the fact this #16 team is better than that #9 team, then YOU ARE MISSING THE POINT! Our presentation was created as nothing more than a rough guide for listing whether key players return or depart as evident in our depth chart formatting. So many of the selections are evidently interchangeable and will adjust continuously until next season arrives. So sit back, unbutton those tight pants from your holiday dinners and leftovers, and take this preview for what it's worth. We think you will gain much more by realizing that the rankings and their explicit accuracy are not the primary goal. This is not about predicting where these teams will finish by season's end, a flaw in logic many assume - it is about where each deserves to be ranked as the season starts. However, in the 13th season of compiling this Early Bird Preview, NationalChamps.net has eerily predicted a very close result to what the official preseason polls will show come August. Returning starters and key losses are not hard to figure out. Unpredictable at this point, though, is just how early NFL departures and bowl game results tend to change these rankings more than any other aspect. We rank what we know and take the rest in stride. Please check back this spring when NationalChamps.net releases our entire 2014 College Football Preview... complete with full depth charts, analysis from our writing staff, rankings, unit power ratings and lots of new digital photos.